That’s what happens when conferences collide. 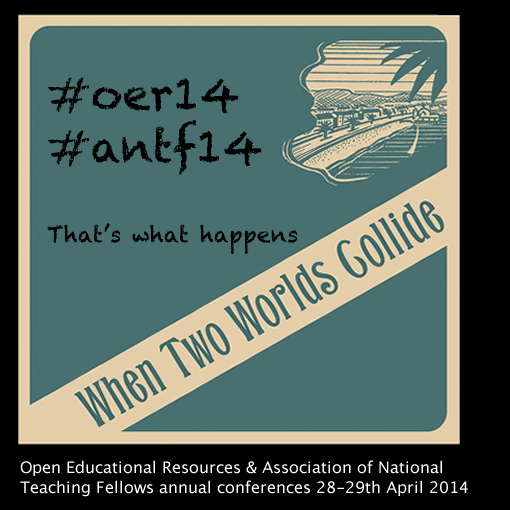 28th and 29th April 2014 sees both the Association of National Teaching Fellows annual symposium in Birmingham and Open Educational Resources (OER) 14 – the conference very much alive and kicking celebrating UK Open Education. THIS IS ONE OF MY SESSIONS LINKING UP WITH DAVID KERNOHAN AND JIM GROOM AT OER14. We will combine our delegate workshops exploring the web and how we can claim and reclaim our spaces on it, and our students’ spaces. WATCH THIS BLOG SPACE! This entry was posted in Blog, Open Education, Presentations by admin. Bookmark the permalink.